Sara DiCaglio – Feminist Science Studies. Rhetoric of Health and Medicine. Health Communities. I am an Assistant Professor of English at Texas A&M University. My research explores cultural, rhetorical, and scientific spaces of reproduction and reproductive loss, drawing from the fields of rhetoric of health and medicine, feminist science studies, and health humanities. 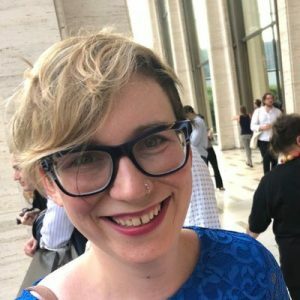 In addition to a dual PhD in English and Women’s, Gender, and Sexuality Studies from Penn State University, I hold an MFA in Poetry from the University of Michigan’s Helen Zell Writer’s Program and an MA in Adolescent Education from Hunter College. My creative work uses poetry and the lyric essay to further explore intersections between science, bodies, and our sense of self. I’m currently at work on my first academic book, provisionally titled Diagnosing Growth: The Problem of Loss for Reproductive Culture, which argues for a reintegration of reproductive loss into models of pregnancy in order to broaden our cultural discourse surrounding reproductive justice and maternal-fetal health.